Image caption The chain employs thousands and has 80 outlets across the world. The owner of Saravana Bhavan - a global Indian restaurant chain - has had a murder conviction against him upheld by the Supreme Court. P Rajagopal, 71, was convicted for ordering the murder of one of his employees in order to marry his wife. A local court sentenced Rajagopal and five others to life in prison in 2009. The Supreme Court was hearing an appeal against that verdict. 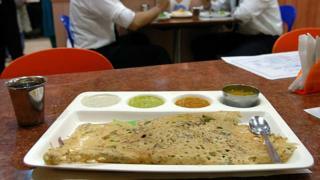 Saravana Bhavan has 80 outlets across the world and employs thousands. A New York Times report from 2014 said Rajagopal was determined to marry the wife of an employee based on the advice of an astrologer. In 2001, when her husband went missing, she filed a police complaint against Rajagopal. His body was found in a forest and police confirmed that he had been strangled to death. The owner was once again embroiled in scandal in 2003 for attempting to bribe the woman and intimidating her family, which included assaulting her brother. A local court first convicted Rajagopal in 2004 and sentenced him to 10 years in prison. This was increased to life in prison by the Madras high court in Chennai. While hearing an appeal against the verdict in 2009, the Supreme Court granted bail to Rajagopal after his lawyer argued that he needed medical treatment. At that point, he had served only 11 months of his sentence. The Supreme Court ruling on Friday means that he will be headed back to jail.